Sometimes the benefits are so clear cut and specific that it doesn't take much explaining...perfect for a blog! 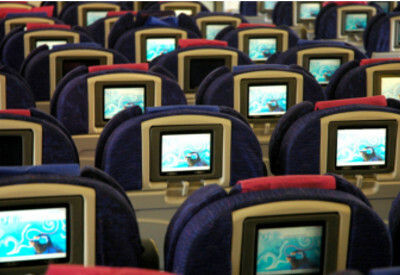 Take in-flight entertainment (IFE) systems for example. The last time you were at an airport, how many passengers did you see having to re-pack their luggage before they could check in their bags? This is because weight equals cost. A big cost. Did you know that on a typical aircraft, every extra kg of weight adds $250 to $500 to the annual fuel bill. A growing number of airlines, particularly for long haul flights, are having in-seat IFE systems installed in their aircraft. Besides from the equipment costs, there are also fuel economy considerations. Now imagine the savings that are possible by reducing system weight - replacing the glass in a typical display with plastic can easily save hundreds of dollars per seat - or many tens of thousands of dollars across a 747, for example. Many airlines would no doubt welcome the opportunity to reduce on-board weight through plastic displays, rather than reduce customer comfort (taking less ice onto the aircraft, removing bins, making blankets thinner).